To make an E whistle get hold of a cheap Clarke Meg whistle in D.
Measure up from the first hole (the one nearest the mouthpiece) 20mm and make a mark with a fine permanent marker. Cover the mark with clear tape or tap very lightly with a centre punch to help the drill bit grip. Drill a 5mm hole using very light pressure and a high drill speed as you don't want to buckle the tubing. 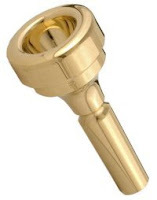 Measure down from the third hole (the third one down from the mouthpiece - the original third one, i.e. the fourth hole you now have in the tube) 14mm and mark again with a permanent marker and tape. Now cover the original fourth hole with a bit of insulating tape (you may be able to get a bit the same colour as the whistle). This is a small hole anyway so its not much to cover. Your whistle now has seven holes. Put your fingers on the top six holes and you should get a scale of E.
If you use your pinky to cover the seventh hole you will hear a concert D.
It may be safer to start with a 4mm drill bit and test the tuning as making the holes bigger sharpens the notes. You could then file out to 5mm with a round needle file. You can also give a few strokes across the new holes with a half round needle file to take off the sharp edges from the drilling. The hole spacing is a bit irregular but it works. Now t0 make a D whistle from a C whistle with a bottom hole for the concert C! 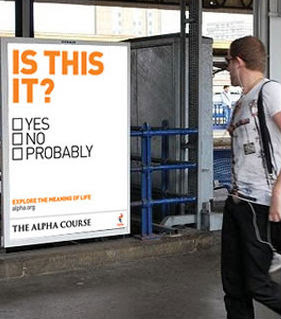 Posters like this are appearing outside churches across the UK as part of the Alpha Course. There is one outside Morningside Baptist Church which I pass every day. This has made me think further about the issue so I present these thoughts as additional to my previous article on the subject. What exactly is "this"? Its not explained on the poster so presumably we are to make up our own minds. 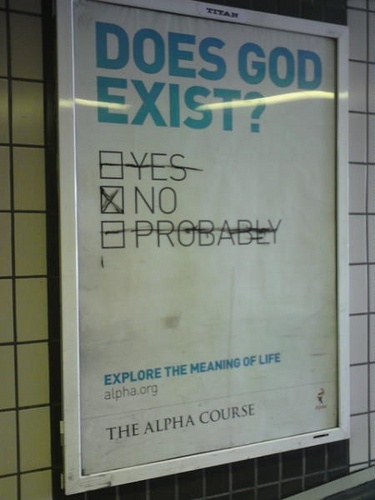 I am sure that the people behind Alpha would say that the question is about existence and the meaning of life, but clearly it is aimed at our satisfaction with the substance of every day life as its during every day life that we are passing and reading this poster. The provocative question seems to be aimed at people who are disatisifed with life. Not just marginally disatisfied with some aspect of their life, but thoroughly disatisfied with everything, and possibly even depressed. Evangelical churches are increasingly relying on exploiting people's disatisfaction with life rather than celebrating what life has to offer. They seem to have got into the business of telling people that life is pointless without God (or more properly their very narrow depiction of God). This is all very negative. What about people who simply don't have the ability to believe in God or people who live genuinely fulfilled lives without God? This is the crux of the matter. I know lots of people who are perfectly contented without any religious belief. This advertising campaign by Alpha - like much of evangelical Christianity - is misleading, because it makes the unsubstantiated claim that without believing in God and Jesus there can be no satisfaction, enjoyment or fulfillment. Clearly this is not true. Most people have no fervent religious beliefs, but live generally happy lives whilst many people with religious beliefs feel unfulfilled and unhappy. There seems to be no connection at all between personal fulfillment and religious belief. So how did the church get here? 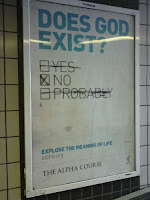 The simple answer is "lifestyle evangelism". Evangelicals facing an ageing church membership and declining numbers moved away from concentrating on the issue of sin, with all its negative connotations, to a strategy of attracting people to the faith through other Christians who displayed themselves as examples of how enjoyable and fulfilling life could be. Its not quite flirty fishing, but its heading there. The problem is that "it" does not work for everyone. Churches are themselves full of people who do not feel particularly fulfilled so its a strategy which is bound to fail. This has done untold damage to battalions of people who have filtered through churches and found that "it" did not work for them. This is why most growing evangelical and charismatic churches are full of very confident, clean cut, younger people with professional occupations. Its not God that has made them like this. They have self selected themselves because they already fit that lifestyle and like attracts like. Edinburgh City Mission has always been an evangelical organisation, but recently it has moved to a more aggressive American style fundamentalist position. A look at its web site shows two projects which are specifically aimed at promoting creationism rather than helping people in need (which was always its primary objective). An estimated 12% of the cities population are students, 26,000 of which are part of the University of Edinburgh. Although the university was founded by John Knox and the Reformers, the Enlightenment of the 18th century gave birth to the Humanism, Evolution and Atheism of Hume and Darwin. Today the University probably stands as the world stronghold of humanistic evolution, and the International Science Festival gravitates around it. ECM has a table outside the library and hot drinks are served to hundreds of students. Using literature and thought-provoking questions on posters, a natural bridge is built along which the Gospel is freely shared. By this means a small, but growing number of students are becoming Christians, and many are being deeply challenged." In November 2006 ECM co-pioneered a special outreach to the scientific and intellectual community based near the University. Deeply concerned about the godless attitudes around them, which can be traced back to the Enlightenment and Evolution, they sought to set up an effective ministry to dismantle the humanistic idol and present the truth of Creation and of Christ. In this way Edinburgh Creation Group was born, the team being made up of scientists and an historian. Since then leading scientists and experts have given regular weekly term-time talks using PowerPoint presentations to classes of students and others. These have been filmed and put on the Edinburgh Creation Group's website. The result of this has been that over 20,000 people world-wide have now watched the talks via the internet videos." This is another example of creationism becoming a prime focus of British evangelical Christianity. This just further alienates anyone with a brain from engaging with Christianity and it turns these groups into fringe cults. Its interesting that the current Executive Director of Edinburgh City Mission attends a church which has had internal strife over the whole creationism issue in the past and (as far as I am aware) does not hold a creationist position at the moment. What we are seeing here is the tip of an iceberg. An iceberg of struggle going on within evangelicalism in Britain on a range of issues from Christianity to Israel - all, of course, imported from the USA as part of their political agenda often through the funding of ministerial positions and Christian organisations in the UK from the USA or the promotion of US based preachers here. I recently made a video that discusses and demonstrates embouchure lip exercises for trumpet and other brass players. Why are Christians so uncomfortable with the idea of evolution? Why do some Christians trust creationist opinions over scientific ideas that have been worked out by many scientists over many years? Presumably they are quite happy to take medicines that have also been developed by scientists over many years, without feeling the need to question its effectiveness. I think the answer is that just as Galileo showed that the sun does not revolve round the earth, evolution challenges Christians to accept that they are not the centre of the universe. A rather humbling notion, especially for the self exalting kind of Christians who tend to be the ones who are very pro creationism. I would say a definite yes to this question. It is a clear demonstrable fact that most Christians do believe in evolution but there are a vociferous minority of fundamentalists who do not, and who intend to convert other Christians to a belief in creationism (a belief that the earth is 6500 years old and was created in six days with all its life forms fully formed). Therefore in the tradition of Plato's conversations I present this fictional discussion between a fundamentalist and an enquirer which is based on the sort of reasoning that I heard regularly during my time as a fundamentalist. Do you have to believe in creationism in order to be saved and go to heaven? No, you just need to have faith in Christ. This is all that is required. See Acts 16:31 and Romans 10:9. Most professing Christians do believe in evolution. For example, the teaching of the Roman Catholic, Anglican and Methodist churches all allow for belief in evolution, so why do we need to believe in the biblical account of creation? Those people are not true Christians. So you would say they are not saved then? It is possible they are saved, but it is not certain as they have rejected the bible as being the word of God. So you are saying that I do have to believe in creationism to be saved? Well its an issue of living the best way possible. Those who are closer to God and more conformed to his will for their lives will receive a greater reward in heaven. See Matthew 16:27 and 1 Corinthians 3:11-15. So there are different classes of salvation? Well if you want to be a true Christian and be absolutely sure of receiving your maximum reward you do need to believe in a lot more than the basic gospel message. This includes creationism, premillenial dispensationalism, the special status of Israel and a number of other things. Believing in these things is God's will for the Christian. They are revealed in his word and will be confirmed to you if you get into a church that preaches the whole word of God and you pray about it. So if I don't believe in those things I am not a proper Christian? Well you seemed to imply it. Well its what I believe, and what all my friends believe. The bible does seem to say these things so they must be true. Therefore if you don't accept them you are rejecting the whole counsel of God and not living in truth. You therefore run the risk of being rejected by God. That's very interesting but I am not sure I agree with you. I will be praying for you, that God will reveal the truth to you.